Approx 3" drop, 1 " wide, on an adjustable leather cord. 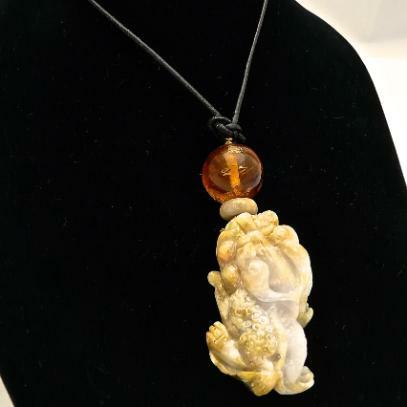 This beautifully carved golden jade dragon has hints of pale lavender along his back. The detail in the carving is wonderful even showing the toes on his feet. I have topped him with a round bead of Baltic amber reiterating the gold in the dragon. This is a gorgeous one-of-a-kind piece. The jade measures 2” long by nearly 1” wide. It drops with the amber bead 3” from a black natural leather cord that is adjustable so it can be worn a variety of lengths. 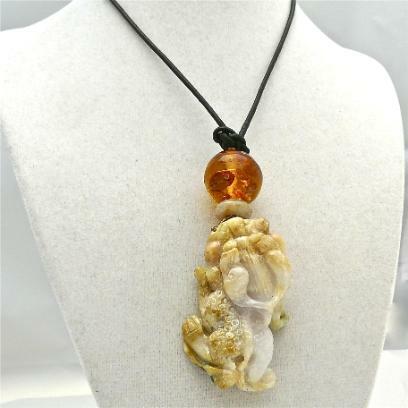 Baltic amber which is millions of years old is the prehistoric fossilized resin of ancient pines often trapping the life of that time as it solidified creating a mini prehistoric map. It has been used as ornamentation since the Stone Age. It is symbolic of marriage, considered good luck and often given as a wedding gift. The Greeks believed amber was a kiss from the sun.